We are committed to operate the business of manufacturing switchgear, project management and maintenance services safely, reliably, and at the least cost. In carrying out our business, it is our goal to realize the work with minimum environmental impacts..
2. Comply with applicable Malaysian statutory regulations and other requirements which relate to company environmental aspects. 3. Commit to continual improvement on environmental performance. 4. Implementing ISO 14001 framework for setting and reviewing our environmental objectives and targets. 5. Communicate this policy to all persons working for or on behalf of the company. Compliance with this policy requires management and employees commitment towards excellent environmental performance. 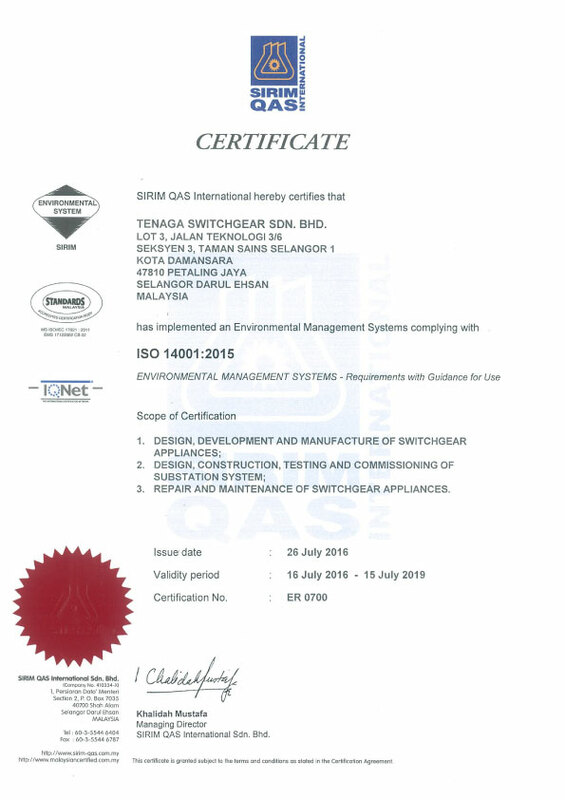 TSG was certified with Environmental Management System ISO 14001:2004 since July 2010 from SIRIM QAS.Compliance to ISO 14001:2004 system, environmental manual, procedures, work instruction and records were developed and recorded. 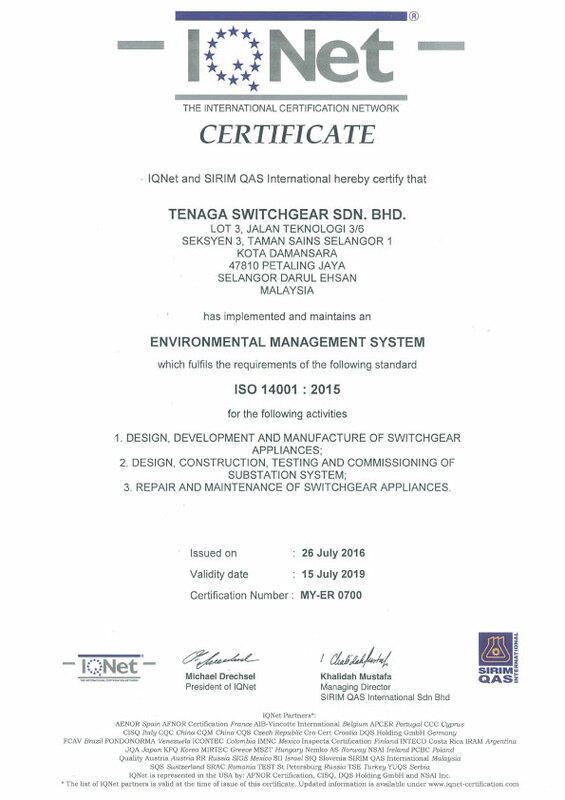 All TSG activities related to environment were monitored to comply with ISO 14001 requirement. TSG is a manufacturing based company producing the High Voltage equipment. TSG compliance to environment, there are no smoke and industrial effluent waste generated from the manufacturing activity which could lead to air , water and earth pollution. Noise generated from TSG activity is within the boundary limit and does not have impact to the surrounding neighbours. There is only a small quantity of chemical such as acetone and alcohol were use as the cleaning agent in the assembly works.The usages of those chemicals were monitored and control. Awareness training on environment by the professional consultant was conducted to all staff. As part of emergency respond an preparedness, chemical spillage training was conducted to staff as emergency plan to control the chemical spillage. I) SW409 – Containers contaminated with schedule waste. Estimated waste generated of less than 50kg per year. Ii) SW410 – Rags, cloth, paper, filter contaminated with schedule waste. Estimated waste generated of less than 100kg per year. Iii) SW109 – Faulty fluorescent light from the building usage. The scheduled waste are handled and disposed accordingly. For Environment Competency to ensure that person is competent on basic of education, training to handling process of schedule waste management. As per legal requirement the contractor for schedule waste disposal was appointed from the Department of Environment contractor approved list. All A4 paper usage to be used on both sides and shall be disposed as a recycle waste category. Water discharged to municipal drain only contained the normal water usage. It does not contain any industrial effluent. As to control the discharge, control especially from canteen activities, oil trap was installed at the canteen piping discharge system. As a conclusion activities carried out at TSG are free from air, water and earth pollution. All domestic waste and scheduled waste generated are handled and disposed accordingly.